The 3S Basic Plus is provided for use with respiratory protective filters [screw-type filters with thread to EN 148-1], assisted and non-assisted fresh air breathing apparatus, air-line systems and Powered-Air-Purifying-Respirators. It is not approved for use by fire departments or as face piece in combination with compressed-air breathing apparatus [certified to EN 136, Class 2]. The 3S Basic Plus faceblank is made of a skin-compatible and largely age-resistant natural rubber formulation. 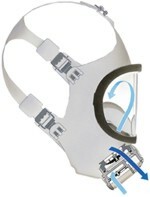 It offers the same good properties the 3S mask series is known for. The acrylic [PMMA] lens is scratch-resistant and almost unbreakable. Moreover it offers a good field of vision. The visor is fitted with a white lens frame and is easy to replace.